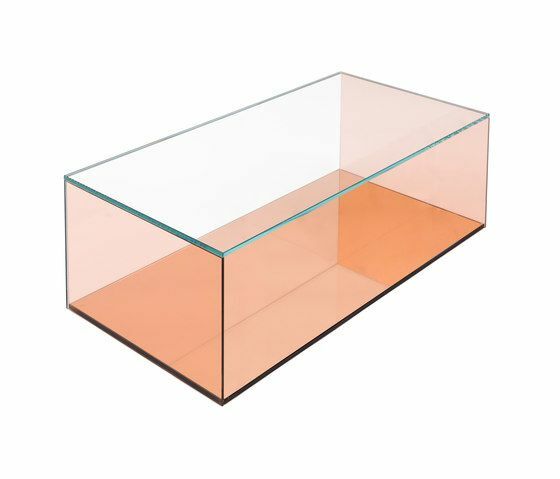 Coffee table of peach glass and mirror features an intriguing merge of transparency and luminosity. Glass coffee table with a clear top, peach sides, and a mirrored peach glass base. 91.4 x 48.3 x 35.6h cm 36 x 19 x 14h "
UV bonded, tempered, clear and mirrored peach glass. Rooted in an analysis of planar relationships, the design furniture collaboration with Chiyome is a study of weightlessness. With a nod to design elements borrowed from fashion, the collection balances opposites: line vs volume, bright vs muted, transparent vs opaque.